The first NATO-Russia Council session in three months saw Russia’s envoy to NATO hit out at the organization’s deployment of extra troops to Eastern Europe. At the talks in Brussels Russia reiterated its call for Kiev to bring military operations in eastern Ukraine to a halt and return to the negotiating table. Russia has warned NATO against increasing activity near its borders at an extraordinary session of the NATO-Russia Council (NRC), held on Monday at NATO headquarters in Brussels. At the talks, held at the ambassadorial level, Russia’s envoy to NATO called on Kiev to halt operations against pro-autonomy militias in eastern Ukraine and implement the Geneva agreement of April 17. This was the first time the parties had convened in three months - an NRC meeting of foreign ministers could have been held at the beginning of April, but it fell through when NATO decided to freeze civil and military cooperation with Moscow. However, it was stipulated back then that if necessary, political dialogue could continue at the NRC at the ambassadorial level or higher. Moscow came forth with the idea of holding an emergency meeting of the NRC devoted to the situation in Ukraine immediately following the fatal Odessa tragedy of May 2. However, for a long time the parties could not agree on a date. Although Russia sought a meeting as early as possible, the alliance offered to meet only on May 27. “Our Western partners, the members of NATO, refused to convene a meeting of the council, and suddenly, after another reminder, they graciously agreed and said they are ready, but only on May 27. We have no doubt that this was conceived solely in order to legitimize the elections planned for May 25.” Moscow is unsatisfied with these developments. Be that as it may, the meeting between ambassadors from 29 countries (all NATO members plus Russia) still managed to take place. Alexander Grushko, the permanent envoy to NATO, participated on behalf of Russia. This, in Grushko's opinion, would make it possible to stop "the special operation of the Ukrainian security forces, which has caused dozens of deaths and injuries and which was launched in order to suppress the protests in reaction to the coup on February 22.” After this, there can be a genuine national dialogue on Ukraine and agreement on constitutional reform that is acceptable to all sides. The Russian permanent representative drew attention to the fact that NATO has provided Kiev, its “partner for peace,” with technical assistance, thereby encouraging the new Ukrainian authorities to continue their use of force. Thus, according Grushko, NATO assumes part of the responsibility for the escalation of the situation and the failure of the political process. Russia’s NATO envoy could not help noticing the unprecedented NATO activity near the Russian border. “It is excessive, not right, and weakens the stability, security, and predictability of the Euro-Atlantic region,” said Grushko. Grushko warned his colleagues at the NRC that if NATO places additional substantial combat forces in Central and Eastern Europe, it will be regarded as a breach of obligation under basic agreements with Russia. In this case, Russia’s withdrawal from the Russia-NATO Founding Act is just one of the possible options, he said. “In military affairs, as is well known, the potential – not the intention – is taken into account. Intentions, as recent events have shown, can be volatile. Therefore, if we see that the new NATO attitude towards relations with Russia manifests itself in corresponding action in military development, expressed in a shift of NATO's military potential to the eastern flank, then we will take the necessary measures to ensure that Russian security does not suffer,” said Grushko. “In general, the conversation was complicated enough, but interesting. All members of the council spoke. We hope that it will provide an outcome,” concluded the Russian permanent representative. In any case, the participants expressed positive views about the withdrawal of Russian troops from the border with the Ukrainian regions. However, they encouraged this withdrawal to be accompanied by additional transparency measures. 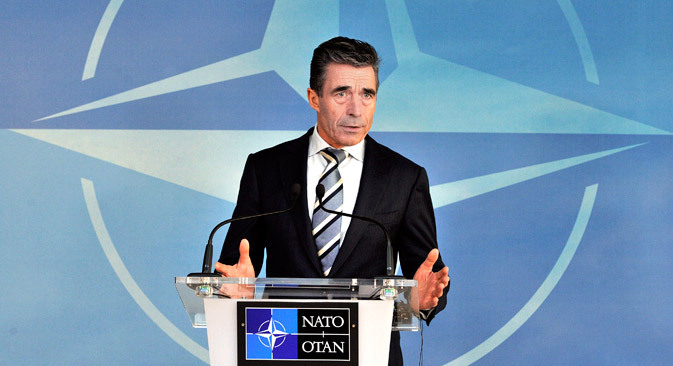 Russia took note of the NATO members’ understanding of the need to implement the Geneva agreement and the recognition that the only way out of the crisis is a political and diplomatic settlement. No one raised the question of when the NRC might meet again.